There's comfort and familiarity when on the home turf. Puppies that are friendly at home may turn aggressive when away from their yard. Some dogs turn on the aggression at the mere sight of ANY other dog, even a familiar pack mate when approached off their territory. It's not unusual for puppies to feel fearful and defensive and react with aggression with other dogs especially when walking on the leash off their own territory. All dogs feel protective of their own turf and may not welcome a strange dog trespassing in your yard. That territorial aggression increases as the puppy matures, and adolescent dogs may need to learn how to manage their protective instinct. Picking up and holding a small puppy in your arms often provokes bigger dogs to jump up to reach the little one. It's actually safer for you to keep the little dog’s four feet on the floor. Dog trainers recommend teaching the dog-aggressive pet a new way to react by helping him associate the presence of the other dog with a benefit. Here's what you can do. Be sure your puppy accepts and pays attention to leash control. A flat buckle collar and leash, a head halter like the Gentle Leader, or a body harness such as the SENSE-ation Harness are ideal. Before starting the walk, fill your pockets with the smelliest, tastiest treat you can find. Liverwurst works well, or see if your puppy likes stinky cat treats. Break them up into tiny morsels, so you have a large supply. It only takes a taste―not a mouthful―to change the puppy's attitude from aggression to tasty expectation. 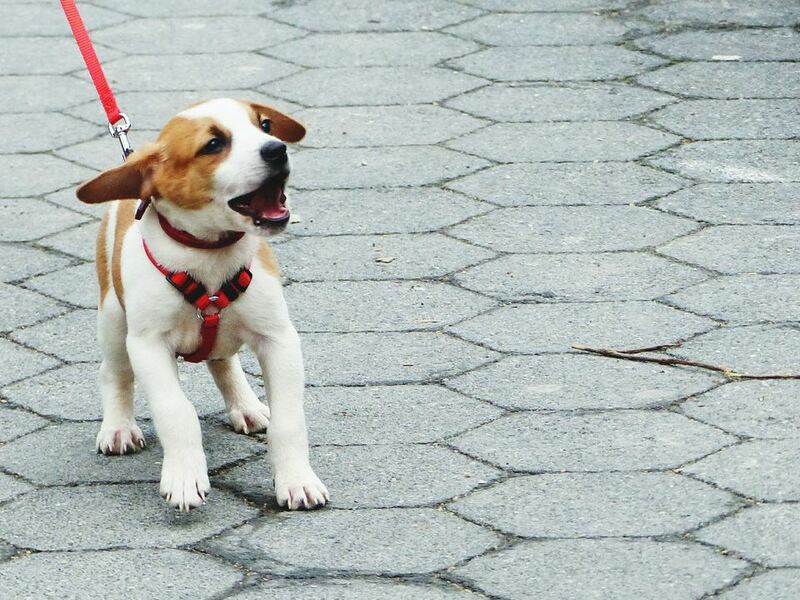 Keep the leash loose, because a tight grip communicates stress and can make your dog feel even more aggressive. When you see the first dog on the walk, use a high-pitched happy voice to say, “It’s a cookie dog!” and immediately shove a smelly treat right in front of his nose. Keep repeating the phrase in the happy voice, feeding your puppy treats as long as the other dog remains in sight. Expect your puppy to act confused, growl or become aggressive. But, they should eventually accept the treat. Continue to use the singsong phrase and offer a bonanza of treats (five or six in a row) whenever you see a dog. That helps your puppy to associate the other canine’s presence with good stuff just for him. For puppies that continue to growl and ignore the treat, keep it under his nose. Once he pays attention to it (since the other dog left), hang on to the treat, close it in your fist, and make a big production of putting it back in your pocket. Your puppy needs to understand he BLEW IT big time, he had the chance and lunged and barked and growled instead, so he gets nothing. Before long he’ll learn he controls whether he gets the treat or not. He has a choice to growl and lunge and get no treat (and never reach that strange dog anyway! ), or ignore the other dog and get paid for being good. Most puppies are smart and soon decide to get paid. Eventually, your puppy will even look to you for a treat before you've had a chance to dive into a pocket. He'll anticipate the treat. Watch for him to see other dogs and then look at you for a reward. The goal is for the sight of another canine that used to trigger aggression instead to change into triggering the expectation of treats. Done with constancy, one-time dog-aggressive puppies may eventually eagerly go on walks and look around to find a “cookie dog” to get goodies.